I was in Park City this weekend for my wife's Rowmark reunion and one of the events on our schedule took us to the mouth of Cottonwood Canyon, and I couldn't resist driving up to the Brighton ski area to see what it looked like in the daylight after a short drive, rather than in the middle of the night after 75 miles on foot during the Wasatch Front 100. (Enlarged photo). Given where it comes in the race and what follows, Brighton and its nondescript A-frame is a signal aid station - the venue for much tragedy and triumph. As my pacer that day, AJW, wrote in one of his blog posts: "Brighton eats runners for dinner!" And it certainly took a bite out of me that night, but thankfully not one so big that I couldn't rally on to the finish. And the night of Wasatch, I actually did my best-ever washerwoman impression heading out of Brighton at mile 75. If I wasn't the personification of someone slowly turning into a tree, I don't know what I was. Just ask my pacer - and the four people who passed us. After the seven mile traverse of the ridge that oscillated between 9,400 and 9,900 feet, we took the long-feeling, but not really that long, descent to the Brighton ski lodge aid station (mile 75). I've come to call it "The Knob," the Quato-like protuberance on my knee that showed itself a number of weeks after a very hard fall I took in early September, 2009, on the Vorberg Gulch trail. My immediate concern back then was toeing the line at Wasatch four days later. And while that went off without a hitch (at least as far as the knee was concerned), Quoto The Knob, seemed to be lying in wait. The orthopedist I saw today for a second opinion, built on my previous exams, and felt pretty strongly that the genesis of my knee pain came back to the injury from the fall, which was right at the insertion point of the IT band. The Knob is doing something to string the ITB too tight or to alter how it tracks over the knee or something else altogether. Makes sense. Of course, he couldn't reveal any pain no matter how much he twisted and stretched and prodded, which makes things maddening for someone looking for some solid answers. So it's no real surprise that before I get a definitive plan of action, there needs to be at least one more expensive test and possibly a bout with a long, steroid filled needle (don't tell WADA). For now, though, I can run a bit as long as I don't anger the knee too much. And keeping up my IT band stretching and rolling certainly won't hurt. Then there's solar therapy, which I'm hoping will work wonders. The extended family is off to warmer climes for a week this Friday, where I plan to get in some easy runs in the soft, warm air and not worry about much of anything, except for tackling one ultra-worthy task: Richardson's tome, Clarissa. 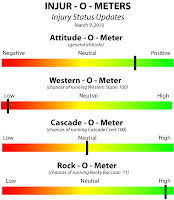 Little change to the Injur-O-Meters, save a small boost in attitude ahead of vacation week. Read all of the The Injury Chronicles. In the natural history of running injuries, I've now crossed into phase IV - recurrence - also known as the backslide, or using pyschological metrics - despondency (mostly joking; mostly). 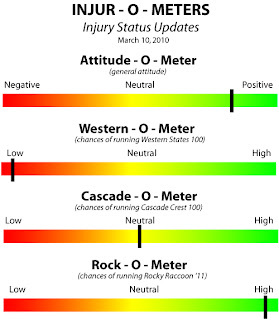 After charting some good rebuilding following a largely run-less winter, things descended quickly last week, with my knee turning to stabbing pain sooner and sooner on each successive run. And while I can't say I'm surprised, since I hadn't really let myself look too far ahead, it was still a jarring turnaround. The shock has brought some things to light. The knee injury is more serious than I'd considered, and it's time for some heroic measures to figure out what it is and to get it fixed if I want to salvage any part of the 2010 season. Western States is almost assuredly out. If all the time off this winter didn't fix the issue, and the knee is now worse than it was in November, it seems pretty clear that I won't have time to resolve the problem and then build up enough to toe the line come June 26. It's hard to even put that down on the screen, and I haven't cancelled my hotel reservation yet, but the writing on the wall seems clear barring an otherworldly turnaround. I need to write regularly about my experiences, observations, and possible insights as I work through this injury. Hence, The Injury Chronicles. The goal is not to validate my whining and sniveling by slapping a label on it. Rather, it is to explore the injury side of my running life (which may have a little whining and sniveling), much like Run Junkie proper is used to explore the running and racing part of my running life. Stay tuned for more TIC, or avoid it altogether. You've been warned.